Honda’s ASIMO has conducted an orchestra and even served cocktails. 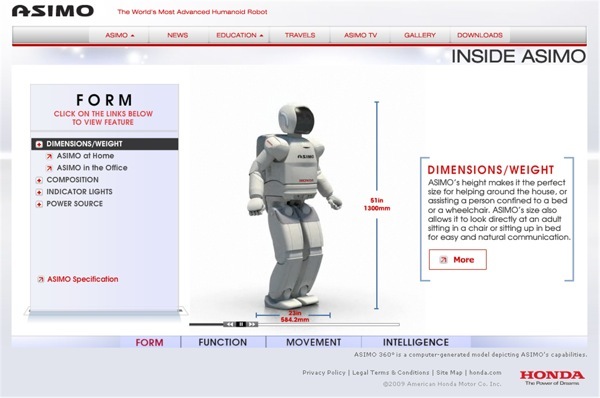 Now Honda has added a 360° look at the technology in ASIMO that lets him do all of that. You can see it here. It’s not just a spinning ASIMO, there’s a lot of interesting information on how it gets around, avoids obstacles, and that sort of thing. Some of you may ask, “What is ASIMO?” Well, Asimo, which stands for Advanced Step in Innovative Mobility, is a humanoid robot designed by Honda R&D. It began as a small project in 1986, but advanced quite a lot and made its U.S. debut in 2002 at the NYSE bell ringing ceremony. I really wish I could have one around to do chores for me, but unfortunately they are a little pricey. Almost $1 million each. Yikes.